You may have noticed a little less of me over the past few weeks/months, and I’m not making a pun about shedding a few pounds. The lack of online presence is because (drum roll, please!) my husband and I are moving! We’ve sold our first home, which was in the most adorable water-front section of College Point (a quiet little town in Queens, New York City) and have purchased our forever home. As emotional as we are to be leaving our first home (and the New York City skyline views! ), we are ecstatic to be heading back to our roots: Long Island. 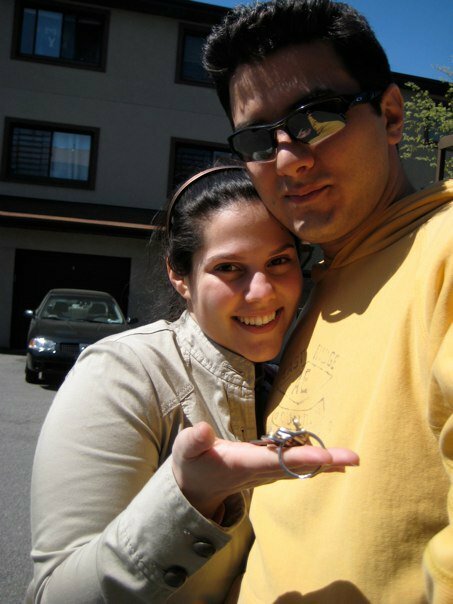 My husband and I were both raised on the south shore of Long Island, and we’ve missed it ever since leaving, four years ago (the above photo is the day we closed on our condo in April of 2010). Our condo sold at lightening speed, and it took us much longer to find our dream home than we anticipated. After searing for months and months, we finally found our forever home in one of our favorite neighborhoods, right near our friends and family. Juliet doesn’t know it, but she is finally getting a yard! Hooray! We need to live with my parents for about a month during the transition, but I am oddly excited about that, too. While the move(s) couldn’t be happening at a busier time of the year for Sincerely, Jackie, I’ve been working incredibly hard to ensure that there are no impacts on current (or future) orders. In fact, the moving process has forced me to streamline my processes in ways I hadn’t ever thought of before, and I’m kind of digging the new flow of things. Even with an improved flow, the next few weeks are going to keep me on my toes. As much as I would love to be sharing the gorgeous designs I’ve been working on (and by gorgeous, I mean “shut the front door!” gorgeous), my blog will most likely be on the backburner. The vast majority of my time will be spent working one-on-one with my clients, packing, un-packing, and Instagraming. On the flip side, once I am settled into the new home, I’ll have tons and tons of beautiful design work to share on the blog. Things may be quiet here on the blog, but rest assured that the pace hasn’t slowed behind the scenes, and I am taking on new orders. Please do not hesitate to reach out if you’d like to get started on something lovely!